The mass cleanliness drive of the 24 km stretch of Kley river was organised by the Apatani Youth Association (AYA) with the theme ‘Be your own Scavenger’, which was supported by the district administration. It was participated in large number by the school children, local public, government officials, ITBP jawans and various NGOs from the state. The Halo society comprising of students of 1997 batch of class X VKV Balijan and VKV Jairampur students provided the refreshments. The local citizens divided themselves into different groups to clean the different stretches of the river starting from its source till the end of the plateau. The Chief Minister appreciated the AYA initiative to clean the Kley river, which he termed as the ‘lifeline’ of Apatani plateau. He wished that the river flow dirt free always throughout the year. Khandu also appreciated the mass initiative that brings out sense of unity and responsibility among the citizens. 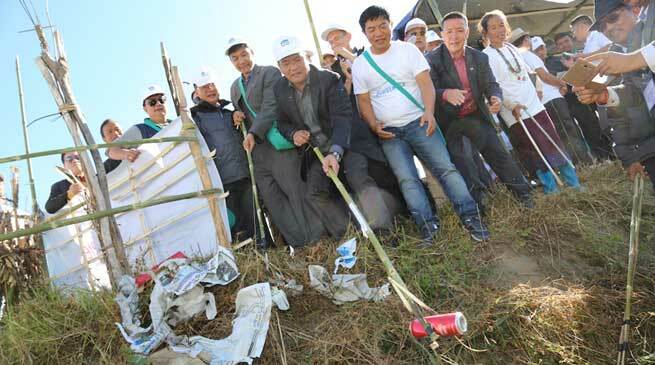 The Chief Minister used the locally made bamboo brooms and devices designed by Narin Ajin Society to pick wastes lying along the river banks. The bamboo devices were designed especially to clean various types of dirt in the rivers such as garbages, plastic wastes, etc. During the occasion, the Chief Minister also participated in the on spot slogan contest. A drawing and painting completion on cleanliness was also held participated by school children. The ‘Clean Mission Kley River’ was participated by PHED Minister Takam Pario, Hydropower Parliamentary Secretary Phosum Khimhun, Transport Parliamentary Secretary Likha Saaya, Raga MLA Tamar Murtem, Ziro MLA Tage Taki, DC Kemo Lollen, SP Ziro Tage Habung and AYA President Taku Chatung.